Cowboy Paradise viewed from top of Mt Tahua. 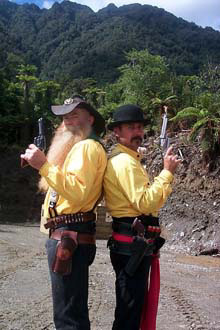 Cowboy Paradise is New Zealand's very own Cowboy Trail End town. The Range is perched on the side of a mountain overlooking a beautiful vista of pasture lands and a bush covered valley, that is home to several hundred grazing Longhorn Cattle, well, actually Hereford / Angus cows and calves and the odd bull. The valley is surrounded by high mountains which is home to many wild Red Deer, while the Arahura River which runs through the valley is the source of some of New Zealand's best white water rafting, kayaking, fishing and not to mention the highly valued jade. For those intending to travel and holiday while in this country, the Wild West Coast has heaps to offer from glaciers, bush walks, gold mines, jade carvings, wild life reserves and magnificent lakes and scenery. : Please send us any digital photos of the Duel 2006 Ernie Southpaw.